ATV-quad rentals Borovets, ATV hire Borovets. 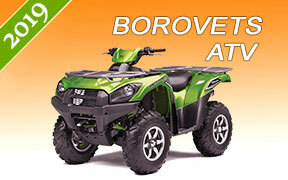 The most convenient and cost effective way to RENT AN ATV-QUAD IN BOROVETS, BULGARIA. We offer different kind of quad bikes for rent via Motoroads.com - 2WD, 4WD, youth, sport, utility, two riders up, and all terrain vehicles. Our ATV rental fleet in Borovets is built of reasonably priced new and used quad bikes at attractive rental rates. We also provide all the necessary ATV gear and riding equipment to make your trip safe and pleasant. Being long in the ATV-quad rental service, we know what you expect from us, and how to treat you - CUSTOMERS SAY IT ALL! We value our returning customers and reward them with great discounts for all quad bike rentals. Also, check our hot deals for motorcycle rental, scooter hire, bicycle rent and snowmobile rentals in Borovets. BOROVETS SKI RESORT » Borovets is the oldest and the biggest mountain resort in Bulgaria where skiers can experience the thrill of a whole range of winter sports. Borovets is situated in Rila mountains at 1350 m altitude above sea level among the aromatic pine woods covering the northern slopes of Mt Musala, the highest on the Balkan peninsula. The official skiing season in Borovets lasts from mid-December to mid-April with the most reliable snow-cover in late February and early March. The ski runs of various difficulty are differentiated for beginners, intermediates and advanced skiers and equipped with international markings and multilingual signs. The runs are bashed and maintained to the highest standards. Good instruction is available for both skiing and snowboarding. Ski kindergarten provides whole day care for 3-7 year-olds. There is a ski rental service next to each lift station. Contact us for our ATV-quad rental services in Borovets.